Toyota C-HR (2018) is a C-Segment, 5-Seater SUV car with 1.8L engine. The car delivers 138 Hp at 6,400 RPM maximum power and 171 Nm at 4,000 RPM maximum torque. 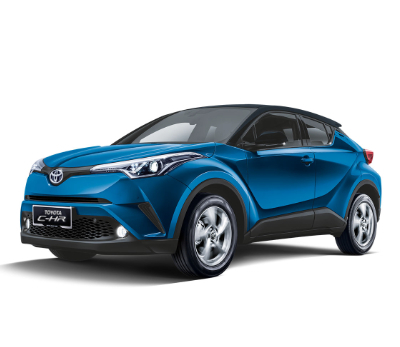 The new Toyota C-HR looks very sporty in five color option included dual-tone Blue Metallic with Black Roof and Red Mica with Black Roof. It also available with Black Leather Seat and 7-inch Capacitive TouchScreen display DVD Player supported Smartphone Connectivity, Wi-Fi, Internet Browser, Voice Recognition, HDMI, USB, Bluetooth, and Reverse Camera. Toyota CHR 2018 price in Malaysia start from RM150,000 for on the road price without insurance. It comes with 5 years warranty with the unlimited mileage.